The recently redesigned Ford Super Series doesn’t have the bad side and Ford also offers an almost uncountable number of versions that will certainly suit everyone’s need. And despite the Ford F-Series outsells everything that moves on the road, Ford’s trucks are also most-up-to-date. Ford, however, introduces upgrades annually and after the 2017 redesign, the heavy-work models get new equipment and options while the next substantial upgrade should be the heavy-duty 10-speed automatic transmission expected for the 2020 model year. So, now if someone needs better towing and load capability than the best-selling F-150 can deliver the next station should be the three-quarter ton F-250 model. And if one wants to get the most of towing and efficiency from this version, the 2019 Ford F-250 Diesel will deliver. For the 2019 model year, Ford brings just a few updates. The late in the year arability will be the Lariat Sport package with 20-inch wheels, black accents, a spray-in bedliner among others. The new B&O sound system will also appear in some versions. 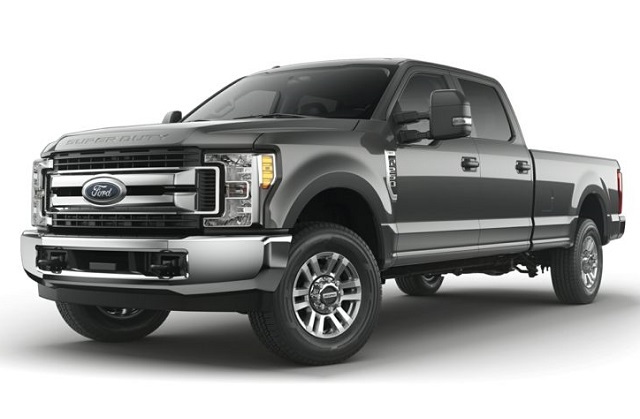 The 2019 Ford F-250 Diesel makes the things possible with the modern lightweight architecture and aluminum-intensive body. That is the formula the light-duty F-150 debuted and for the Super Duty Series applied it in 2017. The successful formula is the high percentage, high-tensile steel chassis and aluminum made body panels. So, the models can tow more while weighing less and improving efficiency. But, the F-250 and other Super Duty models also look good. Ford doesn’t change much on model’s styling for the 2019 model and there is only the new Sport package with dark exterior cues and 20-inch wheels. The rest of the lineup remains in the same form and with the familiar styling elements. The two-bar style grille transits through the trims and changes the finish and the pattern depending on the version. The black and chrome version will appear and the bumpers will also change the color depending on the trim. The trucks will continue with Ford’s C-shaped headlights and more or less chrome applied on other exterior elements. The size of wheels and design will also change with the trims. Interior of the F-250 returns in the same form and again the quality of materials and patterns depend on the trim you chose. Ford’s trucks have well-placed controls and comfortable seats and build quality is also great in all versions but more money means more refinement and tech. Ford also offers a number of comforts and convenience upgrades and many passenger vehicles can’t deliver the level of luxury and sophistication these truck deliver. Ford also equips the trucks with the latest safety tech. The buyers can choose between multiple options and configurations. The body styles return in the regular, extended, and crew cab forms. The cargo bed options are 6.8- and long 8.2-foot length. The base equipped versions get the vinyl upholstery, driver information display, air conditioning, 17-inch wheels, six speakers, etc. The XLT steps forward with the 18-inch alloys, power and heated mirrors, a 4.2-inch display and Sync infotainment system, voice command, etc. The Lariat introduces the tubular side steps, Sync 3 infotainment system with 8-inch center touchscreen, smartphone support, rear parking sensors and more. The King Ranch has a uniquely themed styling and interior, leather upholstery, heated and ventilated front seats, navigation, etc. The Platinum improves with the 20-inch wheels, adaptive steering, multi-contour seats, LED headlights and also adds blind spot monitoring with rear cross-traffic alert. The top-tier Limited adds to that contrasting leather upholstery, a sunroof, adaptive cruise control, surround vision cameras, lane keep assist, etc. Under the hood of the 2019 Ford F-250 Diesel is familiar Power Stroke V-8 turbodiesel while the gasoline-powered F-250 continues with the 6.2-liter V-8. The Power Stroke Turbo Diesel pumps 450 horsepower and torque of 935 lb-ft. The heavy-duty 6-speed automatic gearbox is in the pair with the turbo diesel engine while the gas-powered F-250 has another version of the six-speed automatic. The Power Stroke engine has a uniquely solved inverse-flow configuration and also employs the exhaust brake function. The turbocharger and exhaust manifold takes the position above the engine block between cylinder heads. Armed with this engine, the F-250 can tow up to 18, 600 pounds. The cargo bed can carry up to 4, 200 pounds. The 2019 Ford F-250 Diesel should soon reach the dealerships. The price will range from $33, 150 to $80, 440. The Power Stroke Turbo diesel will appear in the Limited Trim version and cost from $80, 240.